I’ve had some requests for butter cookies in large packs. Here are the first two varieties I came up with and packaging. I was glad to finally find a use for these bags I was unsure what to do with. They have a sturdy bottom, a transparent cellophane front and a beige paper back. Perfect for cookies! I also love the way the cookies can be stacked and create a cylinder. 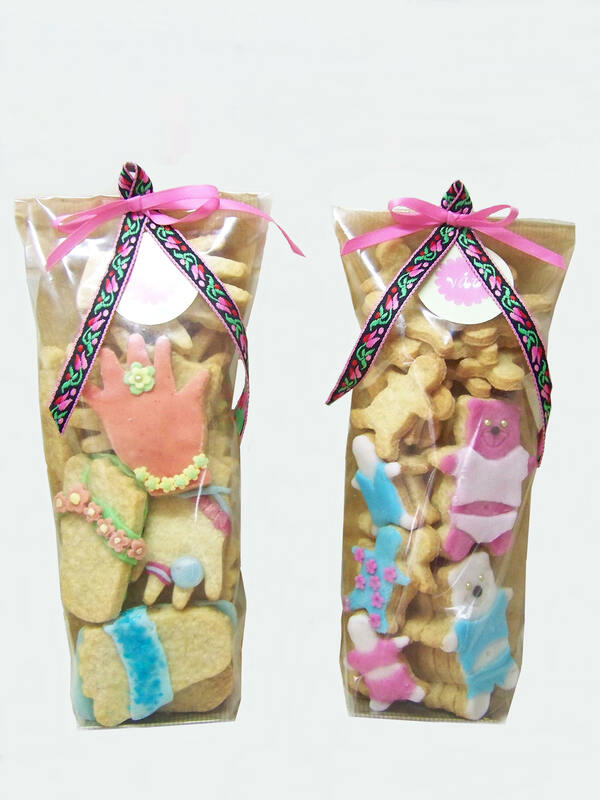 These packs total about 400 gr of butter cookies with a few decorated in fondant I placed in the front. Great gift idea! The left pack is filled with hands and feet, and the pack on the right with bears and little people. I have plenty more shape ideas I’d like to put out there for suggestions, if only I had more time to make them!